High levels of poverty in 19th century Ireland meant that hundreds of thousands of Irish people passed through the workhouses. The workhouses of the North and South Dublin Unions were among the busiest in Ireland, not simply because they were in the capital but because they often took in paupers from across the country. This was especially true during the years of the Great Famine in the 1840s when crowds of desperate, starving people came to Dublin from all over the country. No matter where your family were from in Ireland, they could have found themselves in the Dublin workhouses. You can find out their name, age and religion as well as finding out their previous address, occupation and the names of other family members. Search more than 1,500,000 records covering almost 80 years to find your ancestors in this extraordinary set of records. The workhouses in the North and South Dublin Unions were among the busiest in the country. Historically many types of special social care had been provided in the capital, the Dublin Foundlings’ Hospital for example, took in children from all over Ireland until 1834. Ireland’s poor were regarded as nomadic as large numbers travelled throughout the country in search of work and relief. During the years of the Great Famine in particular, the Dublin workhouses were housing thousands rather than the hundreds they were built for. Until the late 1830s all support for the poor and incapacitated in Ireland had been funded by charity. Unlike the UK, where the care and management of paupers had been covered by law since 1601, Ireland was not covered by a national Poor Law until 1838. It had long been recognised that levels of poverty in Ireland were far higher than in the UK but successive reports commissioned by the Westminster government had failed to agree on a solution. In 1833 the Church of Ireland Archbishop of Dublin Richard Whately was appointed to run the Royal Commission on the Poorer Classes in Ireland which aimed to assess what kind of poor laws would best benefit Ireland. The British government had already decided that they wanted to use the same new legislation that was being fine-tuned in England but Whately ignored his brief and interviewed a wide range of Irish people across all social classes. The reports of the Commission, when they were released between 1835 and 1839 were clear that the cause of Irish poverty was lack of work and introduction of the British laws would simply cause more hardship for some of the most vulnerable in Irish society. The Commission’s reports and their wide-ranging recommendations were shelved and the Government turned instead to Sir George Nicholls, an English Poor Law Commissioner who produced a favourable report about the introduction of the existing UK law based on his observations over six weeks travelling around Ireland. Nicholls helped to adapt the law to an Irish context and the Irish Poor Law was passed at Westminster in 1838 despite unique opposition from all Irish politicians, Catholic and Protestant, Unionist and Nationalist. Those of a liberal disposition were critical of the law’s ability to protect the poor while conservatives were against a tax to pay for the poor as they were aware of the levels of poverty in the country. Ireland was divided into Poor Law Unions which were presided over by Boards of Guardians. The Guardians oversaw the setting up and running of workhouses, the gathering of local taxes to pay for the poor laws and the appointment of staff and contractors. Elections to the Board were often highly controversial. While the idea was to have representatives from across the political divide there were often accusations of partisan voting, especially in the early days of the Unions. In Dublin in 1839 a brawl erupted at a meeting to nominate Board candidates. Irish workhouses were generally built to accommodate around 800 inmates although it soon became clear that more space was needed. 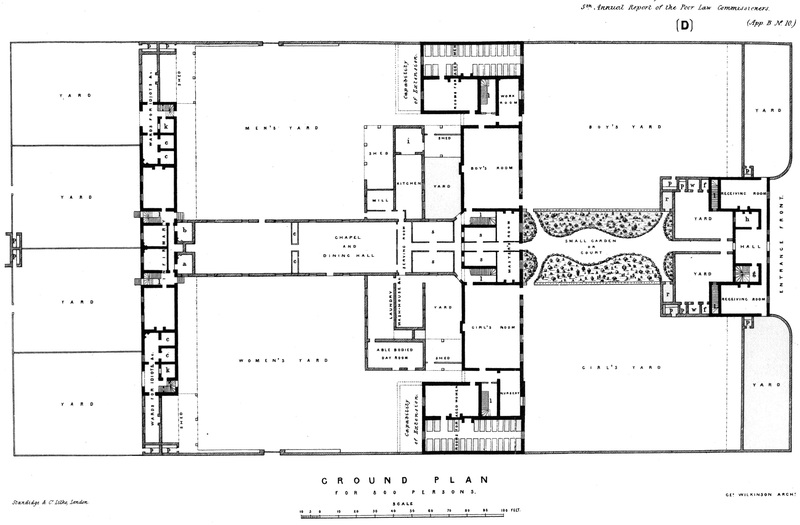 A programme of building took place throughout the 1840s and 50s. Life inside was grim. At first there was no so-called outdoor relief, as would have been common in England. Outdoor relief was when the poor could simply use the workhouse facilities as needed by undertaking a day’s work. Indoor relief was initially the only option and required the poor to prove they were destitute before they were admitted. Once inside the inmates were separated into distinct groups, men and women, adults and children, able bodied and infirm. They were expected to wear a uniform inside and were kept separated from other groups. They were expected to work for a roof over their heads and the work was hard and monotonous. Common tasks included treadmills or breaking apart old ropes into fibre. Women might be employed in sewing tasks but certainly in Dublin, also used the treadmills. Food was also monotonous and basic. Stirabout, a watery gruel was common, as was bread. Once a year the routine was relaxed and inmates had meat to celebrate Christmas. While many lived and died in the workhouse it was not unusual for people to leave. The workhouse authorities would provide a suit of clothes if an inmate could prove they had a chance of work. Dublin had very high levels of child desertion. 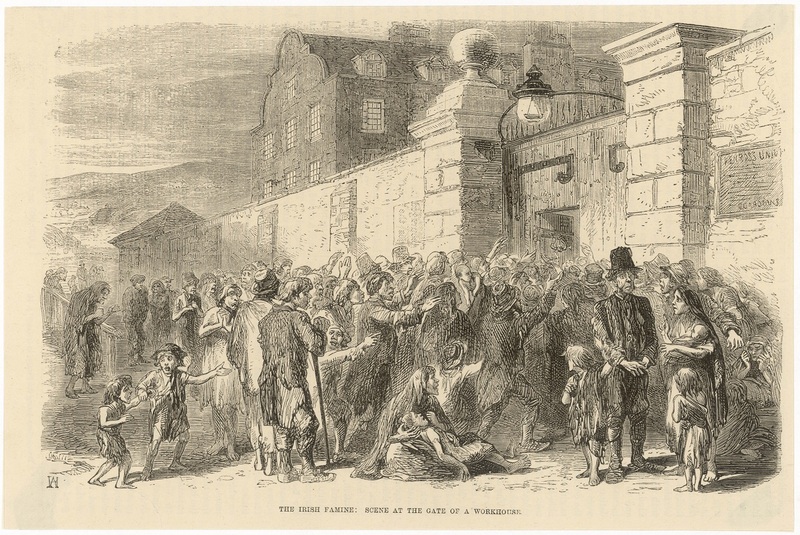 Mothers would leave their children at the workhouse while they went to look for work and there were several cases of children being deserted by parents who had emigrated to America. Deserted children were often fostered out until at least the age of 12 when the workhouse could arrange an apprenticeship. In the early records at least many were named after the street where they were found or after the person who found them. This custom caused quite a bit of confusion so by the late 19th century had been largely discontinued. These records cover three Dublin workhouses - those in Dublin North and Dublin South as well as Rathdown.